With the Wedding coming up in 8.... no 7... oh man.. 6 months.. I'm trying to get myself in shape. It's not a matter of losing weight, but more so I just want to feel healthier and get toned. My biggest problem isn't committing to exercising but what I eat. I tried for a while going on a diet but that didn't last too long because we're always so busy and eating whatever we can when we're on the run. I think you may be shaking your head and agreeing that if not now, there's been a time for you too where you just grab anything from your fridge, cabinets, the store or somewhere unhealthy because you have no time to manage your meals. My future sister-in-law showed me this killer app today and I can't help but share it with everyone I know! No matter what kind of smartphone you have, this app is available and the best part? It's free! 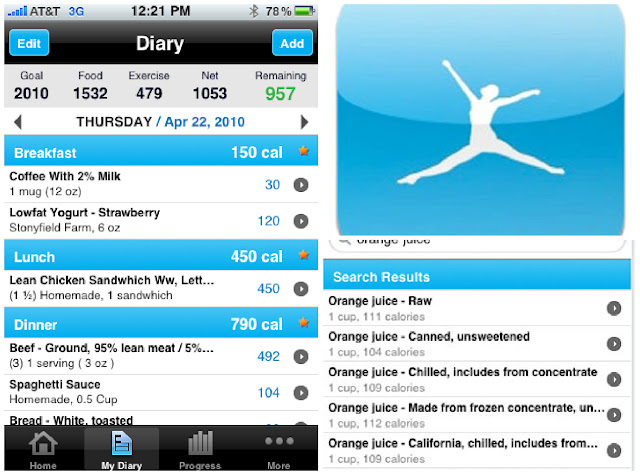 You can track everything you eat each day in a little diary. You begin by putting in information about yourself, such as weight, height, age and then what your goal weight is. You may want to stay the same weight but watch what you eat, lose weight or for some gain weight. What is this awesome app called? My Fitness Pal is the app that I have fallen in love with and I've completed my day one. Below is not my specific plan but screen shots of the app as you'll see the date is from 2010, haha. You can also keep track online if you prefer not to use your phone or don't have access to a smartphone. Enjoy!